Hamilton warned that the PSNI’s Legacy Investigations Branch, which he said was “never designed to be a long term solution to our past”, was unlikely to complete its investigations. Under the Stormont House deal of late 2014, a Historical Inquiries Unit (HIU) of perhaps 300 investigators was meant to be set up to solve cases arising from the conflict, particularly state killings and collusion. However, there is no mention of this under the new ‘Fresh Start’ accord agreed last month by Sinn Fein, the DUP and the Dublin and London governments. After Britain refused to allow its ‘national security’ to be compromised by any future investigations, negotiators instead agreed to drop the plan. Some 937 incomplete cases from the old Historical Enquiries Team and new cases are being dealt with by 55 PSNI members in its ‘Legacy Investigations Branch’ -- including some senior figures who were potentially involved in the murders they are meant to be investigating. Relatives of the victims of the conflict have denounced the deal, which appears to have wrecked their hopes of truth, justice and closure. Hamilton said he felt “real disappointment for the PSNI, and indeed for many grieving families” at the failure to reach agreement on the past. “For many people affected by the past, the perception of independence will only be possible when dealing with the past sits entirely outside the PSNI”, he said. This week, he appointed a detective to review the actions of the British Army’s notorious Military Reaction Force, responsible for scores of paramilitary-style shootings and bombings -- but only days before families of the MRF’s victims were about to go into the High Court to force him to do so. Hamilton had argued there was no evidence of criminal activity by members of the force, even though some members, poorly disguised, revealed very explicit details of their murder campaign in a television documentary last year. Meanwhile, other aspects of the ‘Fresh Start’ deal have caused even greater consternation, as trade union activists joined republicans and socialists in street protests over the agreement to allow deep cuts in the North’s welfare system while control over austerity measures is handed back to the Tory government in London. 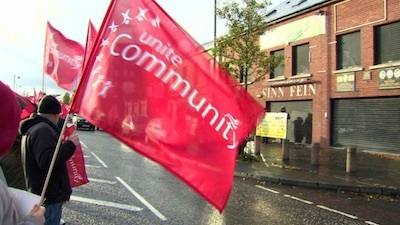 One such protest took place outside Sinn Fein offices in west Belfast last weekend. Party councillors lashed out at those who took part, with one, Ciaran Beattie, describing them as “a group of misfits who are up to their necks in criminality”. Sinn Fein’s leader on Belfast city council, Jim McVeigh, also infuriated the Irish Republican Socialist Party when he claimed that one of its party members involved in the protest was a loyalist wife-beater and drug-dealer. The IRSP called for the comments to be withdrawn. In a statement, they also urged McVeigh to “apologise for attempting to discredit union activists who dared to express their disgust and opposition to this latest phase of Tory assault on the working class”. There was no apology from Sinn Fein, but instead the party’s Deputy First Minister Martin McGuinness directed his fire at the SDLP leader Colum Eastwood. Last week, the newly elected party leader said a lack of policy development had led to Sinn Fein being ‘sold a pup’. “Their long crafted story of skilled negotiation has been exposed as a myth,” he wrote. Mr McGuinness said like all the other parties, Sinn Fein had “faced a choice”. “We could either work to do the best deal possible for the people we represent, or we could walk away and content ourselves with sniping from the sidelines,” he said.